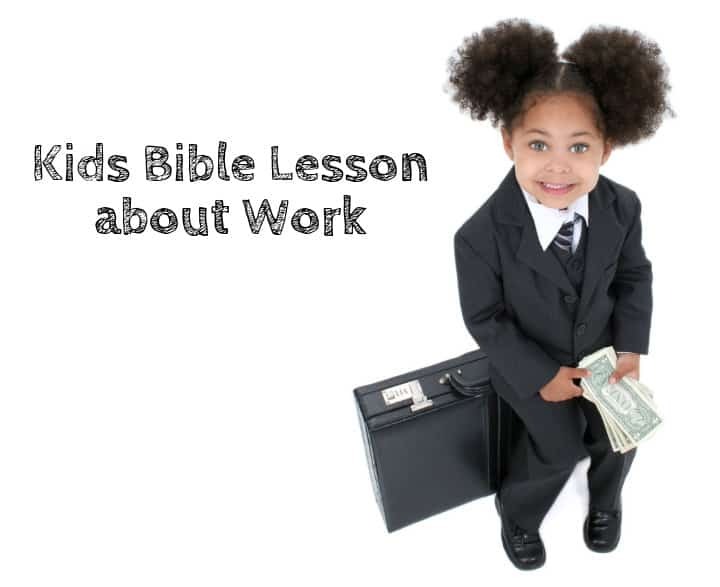 Have you ever taught children what the Bible says about the value of work? Then you might enjoy this simple lesson plan that explains why our jobs matter to God. Children need to understand that working hard glorifies God. Work is one way we love our neighbors and fulfill our purpose in life. These truths are relevant in all of life. I first wrote this for my children’s church, but it would work well as a labor day Sunday School lesson for children. You could also reduce the key points of this lesson for a children’s sermon about labor day. Learning Goal #1: After this lesson, the children will demonstrate understanding of the Bible’s teaching about work… (indicator #1) by discerning between true and false statements related to this topic. Learning Goal #2: After this lesson, the children will demonstrate new positive attitudes about work… (indicator #2) by asking their parents for extra responsibilities at home (then reporting back next week). Explanation: The Bible say much about the topic of work. Some pastors summarize this teaching as the doctrine of vocation. In this lesson, children will be introduced to these concepts and challenged to have positive attitudes about work. Memory Verse: Colossians 3:23 Whatever you do, work at it with all your heart, as working for the Lord, not for men. Optional Coloring Sheet: Do everything for the glory of God. A small item to indicate who is allowed to talk, I suggest a small ball. A way to display the verses such as PowerPoint, marker board, or poster board. Large index cards, or half sheets of paper, for children to write down their take home challenge. You might prepare these in advance if your time is limited. (Optional) Enough Bibles for children to lookup the passage in a sword drill. Introduce Memory Verse: (Say) Kids please listen closely while I say today’s Bible verse. Colossians 3:23 “Whatever you do, work at it with all your heart, as working for the Lord, not for men.” Now copy after me as we say it together. Point to yourself as you talk and to the kids for their turn to repeat. Here are the suggested breaks for their repetition. Transition: (Say) Today we’re learning about work and how God cares about our jobs. Let’s play a game to think about different kinds of work. How does this person help others? What would happen if nobody did this work? Proceed through all the job titles until complete, or stop after about 5 minutes. Transition: (Say) God gives people many different types of work, but they all are important and help other people. Now we’re going to see what God says about work in the Bible. Bible Teaching (or Sword Drill): Display these verses for the children to see and have one volunteer read each. If you’re class has many confident readers you can use these verses as a sword drill. Briefly explain each verse and it’s relation to the topic of work. I’ve included some suggested debrief comments in italics. If time is short focus on the first three verses listed below. (Say) So God gave people work from the very beginning, even before sin broke the world– God wanted people to work. Luke 19:10 For the Son of Man came to seek and to save what was lost. (Say) Did you realize that Jesus had a job to do while on Earth and he’s still doing that job now. Colossians 3:23 Whatever you do, work at it with all your heart, as working for the Lord, not for men. (Say) So God wants us to do our best and work for him in all our jobs. Matthew 22:39 Love your neighbors as yourself. (Say) God also wants us to help others by our work. We can show love for our neighbors in working hard at our jobs. Proverbs 14:23 All hard work brings a profit, but mere talk leads only to poverty. (Say) This is the way our world works, working hard will make your life easier and allow you to help others even more. Transition: (Say) Work must be important to God because he says so much about it in the Bible. Lets get in small groups now to talk about the work you do even now as kids. Discussion Groups: Have the children sit in circles (legs crossed and knee to knee) in groups of about five. Use a small item such as a ball to indicate who has the turn to talk. (Say) The person with the ball gets to tell the group what jobs they have at home. Then pass the ball around the the next person. Only the person with the ball should be talking, everyone else needs to listen to their friend. After all the groups have completed this first task, (Say) Now let’s pass the ball around again and talk about what work you would like to do when you are a grown up. Transition: After they finish the second round of discussion, (Say) Let’s all go back to our regular seats. We are going to play a game to see how much you’ve learned today. Review Questions: (Learning Indicator #1) Read the following list of statements. Explain to the children that some are true and some are false. Ask the children to respond to each statement by standing up if they are true, or sitting with arms crossed if false. After each statement, reveal the answer and very briefly reinforce the correct answer. If some children initially respond wrongly, give hints to help them get it right before you reveal the answer. Take Home Challenge: (Learning Indicator #2) (Say) I want to help you have a better attitude about work, so here is what I want you to do. After church, ask you parents for extra things you can do around the house. Tell them you want to glorify God by working hard. Pass out index cards with the following statement: I will do the following work to serve God and help others _____________________. For extra review, have the children write the Colossians 3:23 memory verse on the back side. Ask the children to bring these cards back in one week and let them share what they did with the class. If you pastor is supportive, he can even read one of these cards to the congregation on Sunday morning. Extra Activities: If time allows, review the memory verse as a group. You can also try these Sunday School Activities using post-it notes. Another related idea is this game that teaches encouragement. It talks about what jobs kids would do when they grow up. Tony Kummer (Editor) reviewed & updated this page on : September 7, 2015 at 8:55 pm. All our content is peer reviewed by our readers, simply leave a comment on any post suggest an update.